Liu Kang is a fan favourite who originally made his debut in the first Mortal Kombat game. He's much older in MKX but still retains the flashy moves that include fireballs, flying kicks and the trademark bicycle kick. His three variations are called Dragons Fire, Flame Fist and Dualist. Due to his Kung Fu appearance, Liu Kang is often compared to the legendary martial arts fighter Bruce Lee. Just like Bruce he has amazing agility and a complete mastery of martial arts. He's something of a hero in the MK series as well - holding the title of the most popular player. Fans will know only too well that Liu Kang has always had a love interest in Kitana, the fan-flicking beauty, but his loyalty to the Shaolin Clan is absolute. 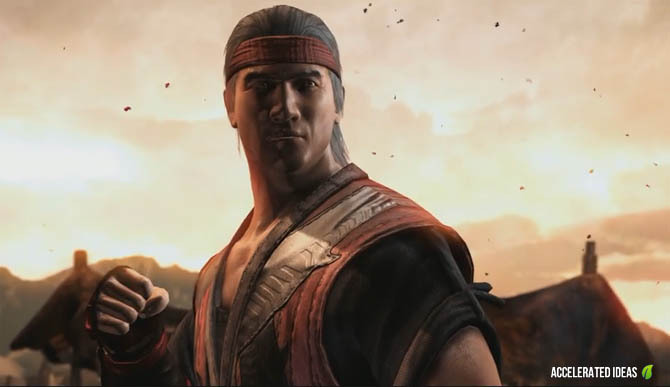 Along with Kung Lao, Liu Kang's long term mentor was the thunder god Raiden. In MKX, Liu Kang's core special moves consist of a flying kick, spinning back hand punch and the classic bicycle kick. Outside of the special moves, players have a wealth of fast combos to choose from. The classic bicycle kick where Liu Kang jumps in the air, spinning his legs around as if riding an imaginary bicycle. These spinning kicks cause multiple blows to the opponents face whilst Kang travels roughly half the screen. In MKX Liu Kang will be standing after the move rather than staggering as in previous games. A spinning back hand punch, that causes the opponent to fly back in the air. The enhanced (EX) version pushes the opponent further away. The classic full screen flying kick that makes Liu Kang sound like Bruce Lee. In this variation Liu Kang gains an empowered Dragon Fireball and also a Flying Kick move. This variation is the classic Liu Kang that fans will remember from previous Mortal Kombat games. Players also gain an unbreakable double enhanced fireball in variation (i.e. you can fire two enhanced fireballs repeatedly). A fast fireball projectile that can also be used in mid-air and while crouching for a low projectile. The enhanced version will shoot two fireballs. The player can also charge the fireball for more damage and also enhance the fireball twice in quick succession. A replacement for the classic flying kick with the added twist of inflicting two kicks rather than one. 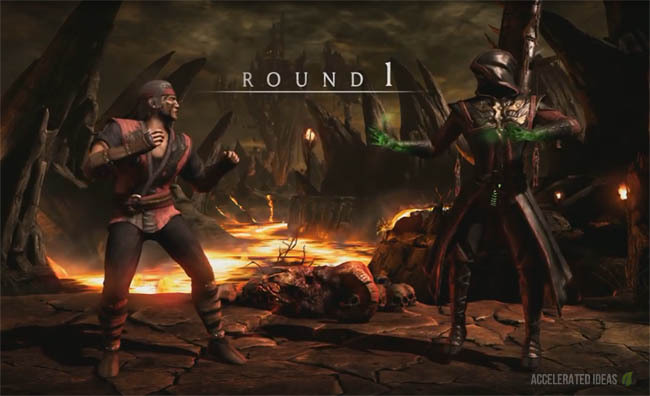 Liu Kang gains a Dragon Parry, Windmill Punch and a Shaolin Flame move.In this variation the fireballs appearance is change slightly whilst the enhanced (EX) version is a single large fireball rather than two seperate projectiles. In this variation the Bicycle kick move is replaced with a close range machine-gun punch move, where he repeatedly punches the player in small doses. A replacement for the bicycle kick which turns the move into a close range fist of fury move. Liu Kang punches his fists together causing his hands to set on fire. Whilst active the Flame Fists cause chip damage, i.e. damage even if the opponent blocks. Similar in many ways to Johnny Cages Fisticuffs variation. The big difference is that the Flame Fist also helps his fireballs cause damage when the opponent is blocking. A defensive move that if timed correctly (just as an opponent attacks) Liu Kang will kick them away and then jump up and stomp on them. In this variation the player can switch between a Light and Dark form to either heal or harm. 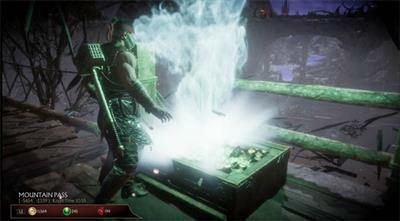 In the Light variation Liu Kang's fireballs turn white and he also gains a healing move where he swings his arms in circles while a white ring of fire encircles his position. The Dark form changes his fireballs into a black and red plasma ball. These darker coloured projectiles won't inflict damage until they explode after a few seconds, making them perfect for trapping the opponent. Whilst in the Dark form, the player can also launch several fireballs at once and even stop the projectiles mid flight to setup complex combo attacks. Change to the Light form gaining a healing move and white fireballs. Change to the Dark form gaining plasma fireballs and a charge. From close range, Liu Kang smashes his fist through the opponents neck and rips out their throat. He then smashes it back into the opponents mouth.